NEW YORK (CNNMoney.com) -- The Federal Reserve made $9 trillion in overnight loans to major banks and Wall Street firms during the financial crisis, according to newly revealed data released Wednesday. The loans were made through a special loan program set up by the Fed in the wake of the Bear Stearns collapse in March 2008 to keep the nation's bond markets trading normally. The amount of cash being pumped out to the financial giants was not previously disclosed. All the loans were backed by collateral and all were paid back with a very low interest rate to the Fed -- an annual rate of between 0.5% to 3.5%. Still, the total amount was a surprise, even to some who had followed the Fed's rescue efforts closely. "That's a real number, even for the Fed," said FusionIQ's Barry Ritholtz, author of the book "Bailout Nation." While the fact that the markets were in trouble was already well known, he said the amount of help they needed is still surprising. "It makes it very clear this was a very serious, very unusual situation," he said. Sen. Bernie Sanders, the Vermont independent who had authored the provision of the financial reform law that required Wednesday's disclosure, called the data that was released incredible and jaw-dropping. "The $700 billion Wall Street bailout turned out to be pocket change compared to trillions and trillions of dollars in near zero interest loans and other financial arrangements that the Federal Reserve doled out to every major financial institution," Sanders said. He said that even if the Fed was right to make the loans to keep the economy from toppling into a depression, it should have made stronger demands that the banks help American consumers and small businesses. "They may have repaid their loans, but that's not good enough," he said. "It's clear the demands the Fed made were not enough." The Wall Street firm that received the most assistance was Merrill Lynch, which received $2.1 trillion, spread across 226 loans. The firm did not survive the crisis as an independent company, and was purchased by Bank of America (BAC, Fortune 500) just as Lehman Brothers was failing. Citigroup (C, Fortune 500), which ended up with a majority of its shares owned by the Treasury Department due to a separate federal bailout, was No. 2 on the list with 279 loans totaling $2 trillion. 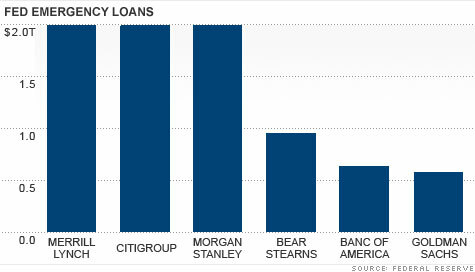 Morgan Stanley (MS, Fortune 500) was third with $1.9 trillion coming from 212 loans. The largest single loan was by Barclays Capital, which borrowed $47.9 billion on Sept. 18, 2008, in the days after the Lehman bankruptcy. The loan financed Barclays' purchase of Lehman's remaining assets. Some Wall Street firms disputed the way the Fed reported the numbers. An executive from one of the firms said that many of the overnight loans were rolled over for days at a time, and that each day it was counted as a new loan. "It's being double, triple, quadruple counted in some cases," said the executive. Can our opinion of banks get any worse? Not all the major banks needed much help from the Fed. JPMorgan Chase (JPM, Fortune 500) received only three loans from this program for a total of $3 billion. The last loan was made under the program in May 2009, and the program, known as the primary dealer credit facility, was officially discontinued in February of this year. The Federal Reserve revealed details of that program as part of a large scale release of data on all the steps it took to stabilize the nation's financial sector during the markets crisis of the last few years. The central bank posted details of more than 21,000 transactions with major banks and Wall Street firms between December of 2007 and July of 2010. In addition to the loan program for bond dealers, the data covered the Fed's purchases of more $1 trillion in mortgages, and spending to back consumer and small business loans, as well as commercial paper used to keep large corporations running. The rescues of the investment bank Bear Stearns in March of 2008, and insurance behemoth AIG in September of that year, were also revealed in far greater detail, as were programs to make dollars available to foreign central banks in return for their currency, in order to keep international trade flowing. Most of the special programs set up by the Fed in response to the crisis of 2008 have since expired, although it still holds close to $2 trillion in assets it purchased during that time. The Fed said it did not lose money on any of the transactions that have been closed, and that it does not expect to lose money on the assets it still holds. The details of which banks participated in the Fed's emergency programs, and how the banks benefited from the transactions, had never before been revealed. The Fed argued that revealing the information could cause a run on the banks that needed to draw cash at the discount window. But under the financial regulatory reform act that was passed in July, the Fed will reveal future discount window transactions following a two-year lag.